Something about the Great Depression must have given folks World’s Fair fever, for at least five different expositions were held in the United States in the 1930s. I can’t say I blame them either, a trip to a World’s Fair would probably do a lot to lift my spirits right now, and I’m not even experiencing economic ruin, severe drought, and another world war on the horizon, but I digress. It seems that these fairs got people to singing, and some of them even had official records released in their honor, to be sold among the countless trinkets and souvenirs that could be brought home from one. Chicago’s 1933 Century of Progress Exposition commissioned two pieces, one a pop song by local bandleader Art Kassel, the other a march by the renowned John Philip Sousa—his last composition, in fact. The 1939 New York World’s Fair got George and Ira Gershwin to pen a song in its honor prior to the former’s untimely demise. The Golden Gate International Exposition of 1939 in San Francisco was not as grandiose an affair, but it still managed to attract the attention of songwriters. One such individual was Mr. Roll Grane of Oakland, California. A California native and member of the California Contented Club, which was evidently a heavy promoter of the San Francisco fair, in 1938 he composed a ditty titled “I’m Off to California in the Morning” to bring attention to the event, and to San Francisco’s bridges. A competent guitarist and vaudevillian vocalist with an eccentric style, Grane himself performed his song for the radio, and copies of the sheet music were distributed around Oakland at conventions in the year preceding the Exposition. Though the fair attracted significant crowds, Grane himself fell victim to obscurity, and details regarding his life and times are virtually non-existent. Hollywood No. 1 (matrix number “H5”) was recorded on September 19, 1938, possibly in either Los Angeles or San Francisco, California, and was pressed by the Allied Phonograph and Record Mfg. Co. It is a single sided record bearing a decorative etching on the reverse. On it, Roll Grane sings and accompanies himself on guitar; his performance is announced at the beginning by an unknown individual. Grane sings his own “I’m Off to California in the Morning”—”telling about our wonderful bridges… and exposition”—in a fashion sounding fresh off the vaudeville stage, and the song itself resembles a folksy take on the same sort of theme as the Century of Progress Exposition’s official song “In 1933”, advising listeners to head to California to visit the upcoming Golden Gate Exposition. This song is Mr. Grane’s sole claim to any sort of lasting fame, and it is probably the only recording he ever made. 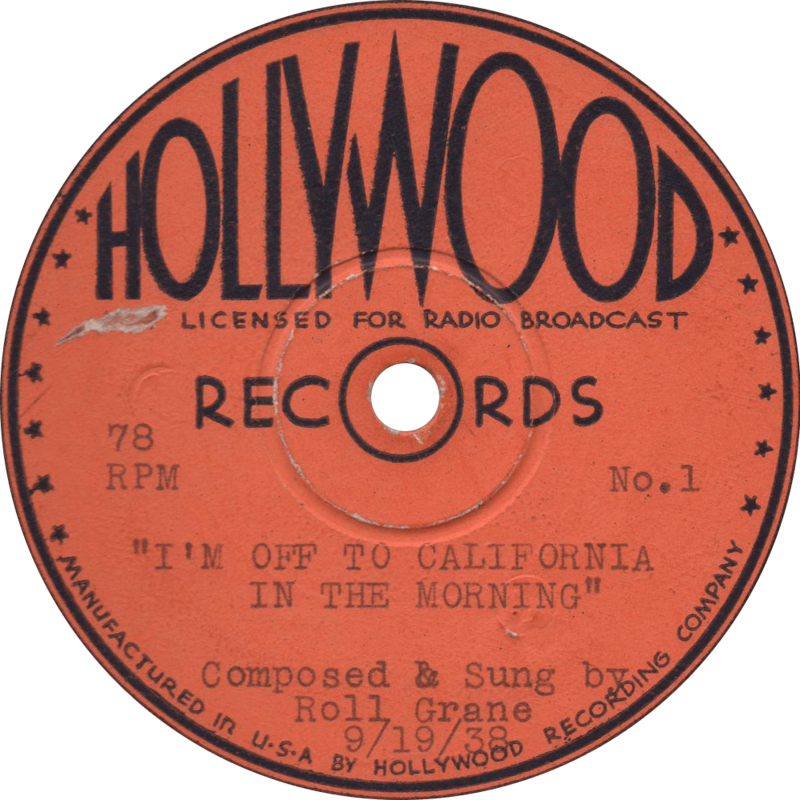 I’m Off to California in the Morning, recorded September 19, 1938 by Roll Grane. Now, if you want to go to heaven, let me tell you how to do it; just grease yourself in a little mutton suet.